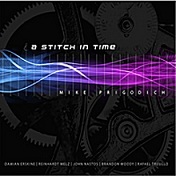 Review: "Prigodich, Mike: A Stitch in Time" - Sea of Tranquility - The Web Destination for Progressive Music! I have always had an odd relationship with instrumental jazz. While I appreciate the technique, complexity, and combination of varied timbres from a musician's standpoint, as a listener, I often get tired of an album after one or two tracks; to me, it all sounds too similar. Fortunately, on his debut LP, A Stitch in Time, jazz fusion pianist Mike Prigodich managed to surpass my expectations by implementing some truly interesting and diverse material. Each track offers something special, and it's a wonderful record overall. The origin of A Stitch in Time is quite inspiration. In the 1990s, Prigodich was part of several small orchestras and groups; however, he eventually realized that getting a full time job was a priority, and he went on a musical hiatus for almost a decade. After getting diagnosed with cancer in 2008, Prigodich decided to focus on putting a band together and becoming a professional musician. He managed to raise $10,000 to fund this debut, which features several notable guests, including Damian Erskine, Reinhardt Melz, Rafael Trujillo, John Nastos, and Brandon Woody. Prigodich prides himself on combining jazz with many other styles, including Afro-Cuban, Flamenco, Tango, Classical, Progressive Rock, and Funk. At its core, A Stitch in Time is like a more mellow and traditional version of Mahavishnu Orchestra and Return to Forever. Opener "Chaos Theory" is a mystery piece; several intricate piano riffs are used as the foundation for horns, bass, percussion, and guitar to dance around, and the instruments complement each other perfectly as each one takes the spotlight at some point. Sections blend together like a suite, and it's actually quite uplifting. Although it may sound like an oxymoron, this track, like the entire album, is a great example of restrained frenzy. "Spanish Swordfight (for Adric)" possesses a focus on Latin rhythms similar to Chick Corea's "Spain," while "At Sixes and Sevens" is built upon complex piano work reminiscent of progressive rock legend Keith Emerson (ELP, The Nice). Elsewhere, classical flutes and delicate melodies highlight "Anneka's Dance," and "Nigel's Theme" features some blistering guitar work that manages to fit in well its jazzy surroundings. The title track is one of the album's more accessible and conventionally structured pieces; in other words, it feels more organized and less improvisational, which isn't a bad thing at all. The album closer, "Stevieland," is great jazz funk, and its name, like its music, is likely homage to the genius of Stevie Wonder. All in all, the entire album is fun and fascinating. Prigodich infuses every second of his debut album, A Stitch in Time, with style, grace, and wonderful musicality. Taking a page from several other artists (which is inevitable these days), he manages to paint the genre with his own colorful style. Although listeners who don't prefer jazz may still find the album to be a bit repetitive as a whole, it's certainly more intriguing, assorted, and inviting than most. In a way, Prigodich's affirmation for life comes through with every note, and the album feels like a celebration of music.